That's right Jordan. 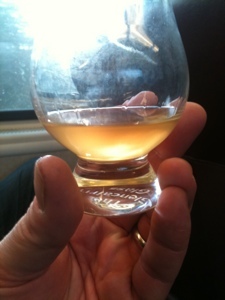 And I'm going to drain this bottle dry and smack my lips and VERMOUTH SHALL NEVER TOUCH IT. Do you hear me. Keep your sour fortified wines away from angelic whisky such as this, my friend, and tell your little demonic minion "The Muse of Doom" too. NO VERMOUTH! 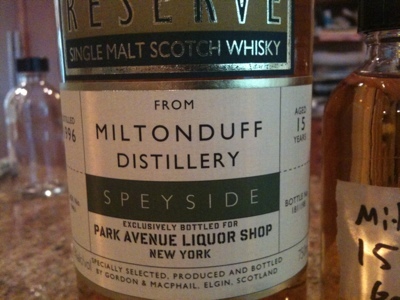 Does something like Malt Mill or Mosstowie count as a separate distillery? One the one hand you could say they were a distillery inside a distillery (MALT-CEPTION! Sorry, couldn't resist) but on the other you could say they were simply an extension of the distillery brand like Hazelburn and Longrow are to Springbank. 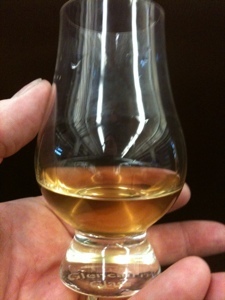 I don't think we'll ever find an answer but it sounds like a fun topic to debate over a dram. 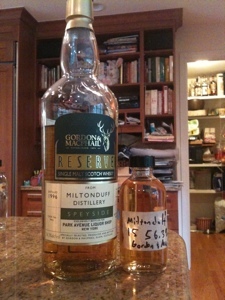 It's a "DBA" for the same distillery. This happens all the time in the Bourbon world. All the Jim Beam Bourbons are made at a single pair of distilleries - sometimes on the same equipment and sometimes on different equipment. Is Knob Creek a different distillery than Bookers, or Bakers, or Jim Beam Black? They are all made at Clermont and that's that. As far as I'm concerned Mosstowie is just the name of a particular pair of stills at Miltonduff. Malt Mill is slightly different because it had different ownership and staffing (sometimes) although located in the walls of Lagavulin. The ownership angle gives it a categorical autonomy argument that Mosstowie doesn't have. I saw this bottle on Bottlespot and decided to buy after reading this review. 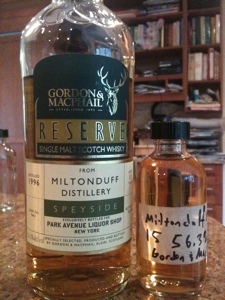 I also have a 21 year Miltonduff private bottling from Gordon's liquor in Waltham MA and really liked the flavor profile. Well needless to say this 15 year blew me away last night. I could not put it down, which was evident from the bit of fog I was in this morning. Similar to the 21 year I have but on steroids. So rich and intense. I'm so happy I was able to help steer you towards this winner, David. A really lovely barrel. Very hard to find now - but delish!